With 2017 just around the corner, we’ve seen a roll-out of new capabilities from AdWords that’s sure to crank up the performance of any PPC campaign. Straddling the line between programming and feed-based advertising, AdWords’ new ad customizer features offer brand new ways to streamline your web campaign. Now, customizers are not a new thing by any stretch of the imagination, but the last year has seen several powerful new toys added to the toolbox. Brand new capabilities take dynamic keyword insertion to a whole new level, allowing for simple functions and code-customized text, as well as an ever-useful IF function that allows you to tailor your ads based on user-end variables, such as the device a user is on, or the audience list the user belongs to. This one little function has streamlined the targeting of digital campaigns to no end. Where you may once have needed two separate campaigns for computers and for mobile devices, customizers can now tweak a single variable to show different results depending on the user-end device. And the streamlining doesn’t end there. The same IF function allows the tweaking of audience-specific ads, allowing you to set different audience groups and target each with their own unique ad text. This function allows advertisers to maintain different bids and ads within a single ad group, eliminating superfluous spreadsheets, and ad groups from your account’s framework. Customizers also allow you to leverage the data from an e-commerce feed into relevant ad-targeting. With dynamic keywords generated based on incoming merchant-center data feeds, you can nail the latest product-buying trends and adjust your advertising content accordingly. Another useful feature in the customizer arsenal is the targeting attributes that allow users to tailor their ads depending on a host of targeting options based on keyword, campaign, or location. Location-targeting is a particularly useful tool for businesses wishing to refine their targets based on geography, and can show varying, location-specific ads without creating a whole new campaign specific to that area. Businesses straddling national or provincial boundaries can use it to navigate language barriers and make sure, while using it to advertise different delivery times or rates based on a user’s distance from HQ. Plus, the added option to restrict ads from showing in certain locations also helps pinpoint your target audience, preventing you from funneling money into clicks from locations that your business does not serve. 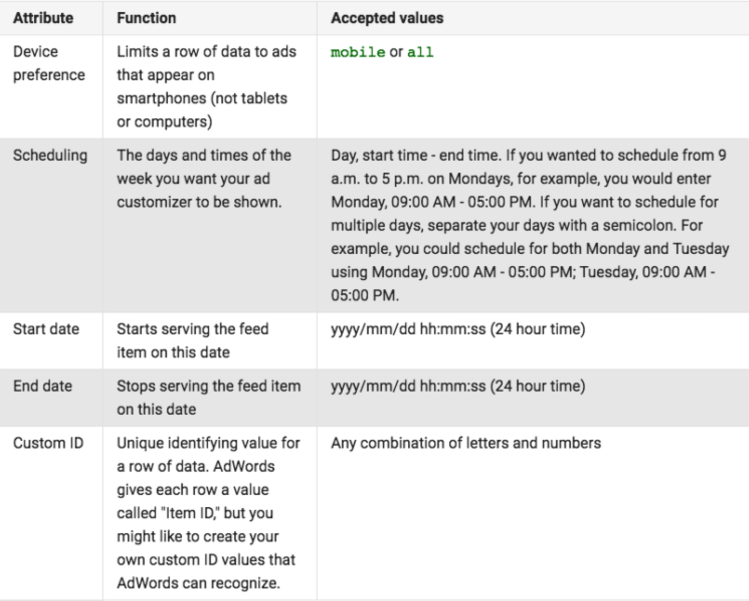 One of the standard attributes of customizers is the ability to specify ad schedules (full table below). Now you can schedule your ads at different hours of the day or night, to take advantage of peak social media times and get the most out of your customer’s midday Twitter procrastination in the workplace. Rather than maintaining separate ads, Business Data now allows you to consolidate the various components into one streamlined process. Another nifty feature that comes with customizers is the countdown timer. Use it to count down your Black Friday promotions, or your boxing-day blowout. The timer works in all languages, and, as a bonus, is context sensitive – allowing you to display the time in days when appropriate, but changing to minutes and seconds as you near the end of your promotion. With ad customizers, you can now schedule your inventory data to be automatically uploaded to Google every six hours. By inputting data via Google Sheet or a file on a web server, you can keep your ad campaign tethered to your product availability, and avoid running ads on products that may be out of stock. With all these new capabilities at its disposal, ad customizers have become a powerful tool to optimize any digital campaign. They’re well worth a try if you’re looking to give those valuable click-through rates a boost.